The words 'heart' and 'chemistry' are sometimes used to describe a television show. It's rare but when a series clicks it can be an enormously satisfying experience. It can take a couple of seasons (if a network has any confidence at all) to build an audience and develop its characters. Rarer still is a show that develops an emotional center and chemistry in its first season. For the CW's Arrow spin-off, The Flash, it has become a comic book fan's dream in its reverence for the source material and its ambitious storytelling. 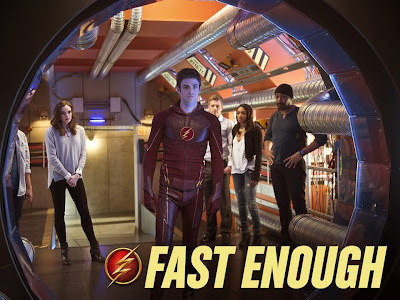 The season one finale,'Fast Enough,' wore its heart on its sleeve leading to a world of possibilities for next season. The Flash has become that show that has hit all the right notes in its debut season making it the rookie of the year. The question that hangs over the episode is 'should Barry go back in time and save his mother?' Barry is conflicted because changing the past could alter his present life and possibly wipe out every relationship he has as he knows it. If his mom lives he'll never move in with Joe and Iris and never meet Cisco and Caitlin. He seeks advice from the father figures in his life. Harrison Wells/Eobard Thawne, despite being a sociopath, has learned to have affection for the present Barry while harboring hatred for future Barry. He explains he has a chance to save his mom by using the particle accelerator to break the time-space barrier and open a wormhole that could help return Thawne to his time. It's a deal with the devil, but one that has Dr. Martin Stein's sees as scientifically feasible albeit dangerous. Joe encourages Barry to change the past but obviously feels torn about being erased as his foster father. This leads to another emotionally honest scene between the two. Joe, as played by Jesse L. Martin, has been for the majority of the season the voice of reason, the conscience and soul at the center of Barry's life. He's always been there to offer advice that Barry would take to heart but oftentimes ignore. The last episode, for example, 'Rogue Air,' he warned Barry about the risks enlisting Captain Cold to help transport the pipeline villains. Still, these heart-to-heart talks are nothing new to the show and that's why they resonate so much in the finale. This is the genuinely loving relationship that is expressed in this otherwise superhero action story. The Flash is not afraid to make their characters vulnerable at times to exhibit human emotions. It's quite a feat for any show, but it's especially remarkable for one based on a comic book. If your tear ducts couldn't take anymore, Barry also talks to his biological father, Henry, in prison. Again, Grant Gustin does some award-worthy work as a man conflicted who wants to do what he thinks is right, what he's been trying to do for most of his life, and that's to prove his father's innocence in the murder of his mother. Henry explains that he's proud of the man Barry has become and that his mother wouldn't want him to take such risks. Henry believes the events of the past shaped the person Barry is now. John Wesley Shipp also shines, as he has all season, as the nurturing and loving father who's been wrongly incarcerated. It's another dimension added to the growth and maturation of Barry as he expresses his inner turmoil. Ultimately, he decides to try and save his mom. An encouraging word from Iris settles him a bit before racing around the tunnels of STAR Labs on his way to that night years ago. He arrives in his old bedroom and as he attempts to intervene in the killing of his mother his future self waves him off. Barry has to painfully allow his mother's death to happen while only being a few feet away. He races to her side moments later and is able to tearfully tell her that he and his dad are well in the future. It's another heart-wrenching scene that works because this is where we've been led to all season. It's a sad but satisfying conclusion to this storyline. Wells prepares to return to his time through the wormhole in a pod, "Rip Hunter would be proud of," when Barry bursts back to the present crashing into him. The pod rests in pieces and Wells is enraged. Wells eventually gets Barry by the throat promising to kill everyone he cares about after killing him. Suddenly, a shot rings out and it's Eddie, the ancestor to Eobard Thawne, who takes his own life to save everyone sending Wells into a painful death. Eddie became the hero he thought he never would be, the irrelevant pawn of fate as Wells had informed me. His future was in his own hands, the only one in this story as Dr. Stein had told him that could change his destiny. In the moment, he sacrificed himself to save others rewriting his legacy. Eddie's death opens up a bunch of questions like wouldn't it mean that Eobard was never born and was never able to kill Nora Allen or build the accelerator that would create so many meta-humans? Does this mean that DC's multiverse has arrived on television? Wells told Cisco he too was affected by the accelerator because he can recall what happened in the timeline where he died. Does this mean we'll see him as his comic book persona, The Vibe? In this timeline or another? It sure looked like Jay Garrick's helmet that popped out of the wormhole. So many questions to answer next season. The real emergency and cliffhanger that sets everything up was the singularity that opened up wider and wider swallowing up everything in sight and where Barry was last seen trying to close it. The Flash was able to do what many shows have a hard time doing. It kept the spirit, wonder and fun from its source material while developing its characters and maintaining an emotional center. It was also the best comic book show of the year. It wasn't perfect but it wasn't afraid to be ambitious in its storytelling like including other heroes and villains. The season finale rewarded fans with a great spectacle at the end but built it on the sentiments for its characters by actors that gave it their all. Season 2 should be more of a good thing.